Chicco Keyfit 30: (~$200) We have and love it. 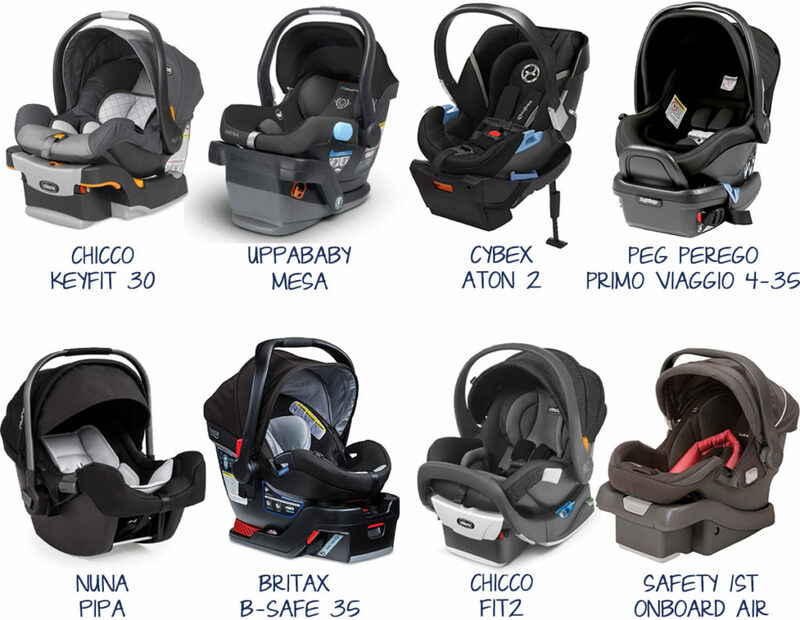 There are so many really great car seats, a lot depends on your budget. It is reasonably priced, lightweight and is consistently rated as one of the top car seats by consumers and multiple third party sites (including Consumer Reports). It is also compatible with most strollers. You could also look at the Chicco KeyFit 30 Zip. It’s new, costs about $30 more and comes with a few more bells and whistles for more convenience, ease of install and weather protection. UPPAbaby Mesa: (~$300) A great car seat that is easy to install. You should probably get this one if you are getting an UPPAbaby stroller because it will easily snap into that. If you are getting a different stroller, make sure you can get an adaptor to make this car seat work with it. Cybex Aton 2: (~$300) This is a great car seat. Before purchasing, make sure it is compatible with the stroller you’ll be using. This one has a load leg that reduces force on the child in an impact. It also helps prevent the car seat from moving forward in an accident. Peg Perego Primo Viaggio 4/35: (~$300) This is a great choice. It looks nice and performs well. The biggest downside (aside from the high price) I’ve heard is that the manual is poorly worded and increases the potential for misuse. Nuna Pipa: (~$300) This is a really nice car seat, that also comes with a stability leg. Britax B-Safe 35: (~$200) If you are getting a Britax or BOB stroller, this is a good car seat to consider. Chicco Fit2: (~$280) This one just came out. The Car Seat Lady (a well-known car seat specialist), just wrote a glowing review of it. So, this is one to check out if you are looking for other options. Safety 1st OnBoard 35 Air: ($100-$170) This has the lowest price of all the mentioned infant car seats. It lacks some of the bells and whistles, but it is a great car seat at a more affordable price. It’s also easy to install with the seatbelt, without the base. Unless your baby is off the charts in weight, you can pretty much ignore the infant car seat maximum weight limit when deciding which one to buy. Babies almost always outgrow the length limit way before they reach the weight limit. Most people move on to a convertible car seat around 12 months, even if their baby hasn’t reached the height limit. So, don’t spend more money for a 35-pound weight limit — you won’t need it! The height/length limit, on the other hand, will help you out. The average 12-month-old is about 31 inches (so, they’ve outgrown most infant car seats). The average 24-month-old is 33-35 inches. On average, the Chicco Fit2 will work for your baby for an entire year longer than any of the car seats with a 30″ limit! Assuming you are starting with an infant car seat, you won’t need this until closer to a year. So, it’s probably best to wait and decide which one meets your needs when the time approaches. The perfect convertible car seat for you is the one that fits in your car and your child. If your child is tall for his/her age, a different car seat would be recommended to allow for more time before it is outgrown. Also, before you actually need this, they may come out with an awesome car seat that you want even more! Ideally you would want one with high weight and height limits to allow for extended rear-facing — NHTSA (National Highway Traffic Safety Administration), AAP (American Academy of Pediatrics) and every single certified car seat safety technician says the minimum age to flip a child forward facing is age two, but to ideally wait until your child has outgrown the car seat height/weight requirements for rear-facing. Fortunately, with most convertible car seats, most children can rear face four-years-old! Kids are about 5X less likely to die or have serious injuries when they are rear-facing. If you want to know some of the science behind rear-facing, check out Car Seats for the Littles. In Sweden, they rear face kids in cars until they are between four and six years olds. Child fatalities and serious injuries in car accidents are close to zero! I’m clearly a big supporter of extended rear-facing. If you are buying or receiving a used car seat, make sure it has not been in an accident and it is not expired. If it’s been in an accident, there could be a hairline fracture not visible to the naked eye, but enough to compromise the structural integrity of the seat. Some people doubt the need to pay attention to the expiration date. I assure you, it is not a ploy by manufacturers to get you to buy a new car seat. The plastic degrades over time.